B&W 683 S2 Theatre review | What Hi-Fi? We think Bowers & Wilkins’ brand-new 600-series speakers are great. It was love at first sight with the stunning 685 S2 standmounters, and we’ve waxed lyrical about the 683 S2 floorstanders. Will it be the same with the obligatory 5.1 speaker package? This B&W 683 S2 Theatre combo is, as its name suggests, built around the superb 683 S2 floorstanders. At £1150 a pair, they’re the unequivocal leaders of their class, delivering a combination of transparency, detail and dynamics that's currently unmatched. The rest of the system uses speakers from the new range, too: the HTM61 S2 centre speaker (£550), 686 S2 rear standmounters (£350) and ASW610XP subwoofer (£700) complete the package. The new 600 series shares a lot of technology with B&Ws’ pricier CM range, and it shows in the performance. The biggest change is in the use of the CM series’ ring-reinforced decoupled tweeters. It’s a clever design. The thin 25mm aluminium dome tweeter is reinforced by a thicker outer metal ring (seen on the flagship CM10 loudspeaker), which ensures better damping. The assembly is further suspended (decoupled) in a gel ring to minimise resonances from the mid- and bass-drivers. It all aims to deliver more precision in the upper reaches of the frequency range – and it hits that target square-on. The bass drivers in the 683 S2 floorstanders have also been reinforced with rings of aluminium (the stiffer construction reduces distortion), while B&W’s distinctive bright yellow Kevlar-woven FST drivers handle the midrange frequencies on the front three speakers. And we have to take our hats off to B&W for finally putting a protective grille around that delicate soft-dome tweeter, which can be so easily damaged by prodding fingers. It helps with sound dispersion, too. The 683 S2 Theatre is available in black ash or white finishes. Gone are the days of wooden veneers, as the monochrome colours have by all accounts proved more popular. The sub has a velvety, matte-vinyl wrap around it that feels nice to touch, although we found a slight tear in the material around the edges in our sample. We like the clean, uncluttered look of the speakers, offset by the pop of yellow Kevlar. The cabinets are nicely built, with neat, square edges – but we can’t help feeling they look a little plain at this price, even though B&W has purposely opted for a simple, modest finish. The ASW610XP subwoofer is a small but powerful beast, with 500W of amplification driving the 25cm cone. Line and speaker inputs, as well as multiple EQ settings, are present on the back panel. 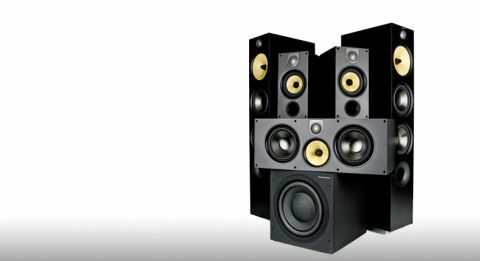 The speakers are all bi-wirable, and the 686 S2s include wall-mounting brackets on the back. It’s worth mentioning that the speakers in this system are a mix of two- and three-way driver configurations, with cones of different sizes. While the 25mm tweeter remains consistent, the midrange Kevlar drivers and bass cones differ from speaker to speaker. Some speakers – the 683 and 686 S2s – also feature a front-facing port that uses B&W’s Flowport technology for cleaner bass performance. The mix of speakers might make practical sense, but before our first listen we can’t help wondering if the differences will affect the package’s integration too much. So we fire up Thor: The Dark World and the 683 S2 Theatre powers through the DTS-HD Master Audio soundtrack. It packs a good deal of punch, with crashes and explosions supplying a satisfying range of thumps and wallops. There’s a pleasing sense of scale too, and we can credit the impressive 683 S2s for adding height to the wide soundfield. Detail? Bags of it – and it cut through thanks to the revamped tweeters clearly. High frequencies have bite and sparkle, but stop short of coarseness. The speakers confidently portray the shifts in atmosphere, too. We know the B&W speakers go loud, and they get the chance to really show off their dynamic ability when Thor’s hammer gets smashing. But we can’t help feeling like there’s something missing. It takes us a while to realise that, while we’re having fun, the package hasn’t blown us away. We thought it would. There’s a sense that the sound should be grander – more powerful – and that effects steering should be smoother. We want more depth and rumble to the bass, too. The ASW610XP is a talented sub on its own, but it can’t quite keep up with the sheer muscle of the 683 S2s. The same goes for the centre speaker. Voices are richer, more nuanced and full of personality when they’re delivered from the 683s, but when the on-screen dialogue is happening bang in the middle, the centre channel isn’t quite as insightful or layered as we’d like. While the centre speaker and subwoofer are designed to work with the 683 S2s, the differences in driver size and configuration seems to affect integration across all the speakers in the package. Sound just isn’t quite unified as it travels around the room. The KEF R100 5.1 package is the B&W’s direct rival. Instead of using different driver configurations, it uses identical speakers that use identical Uni-Q single drivers – and it comes out on top with a stunningly seamless and precise surround-sound performance. The KEF’s subwoofer digs deeper and is more muscular too, giving greater authority and scale. The B&W speaker package relies heavily on the merits of the 683 S2s – and rightly so, as they’re easily the most overtly talented aspect of this 5.1 package. But they cast a shadow over the rest of the system, which is a shame as the 683 S2 Theatre is a few tweaks away from being stunning. It’s not quite the class-leading package that we were hoping for, but it’s still definitely worth an audition.